One can use raw masala ingredients or masala powder or combination of both. -Soak the channa over night. -Pressure cook channa till soft. -In 2 sp of oil, Fry onions,garlic,ginger till onions are pink. Add tomatoes and cook till done. - Let this cool for few minutes, once cooled, blend it to find gravy along with few of the boiled channa. -In a tava, add 2 spoons of ghee/butter/oil, fry little cumin,saunf and add the grounded gravy. - Add coriander powder, garam masala powder, chilli powder and salt. 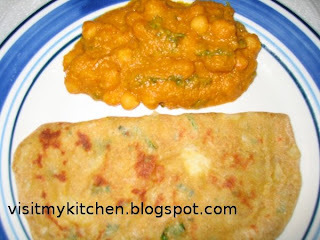 - Mix in the boiled channa and let the whole mixture cook for 7-8 mins till channa is well absorbed. **Need not necessarily add some channa while blending. But this gives some thickness to the gravy and also makes the dish more gravy. Need not grind channa if you prefer more of solid channas in your dish. sowmya, looks very tasty and yummy. potato is my favourite dish,will try tomorrow.